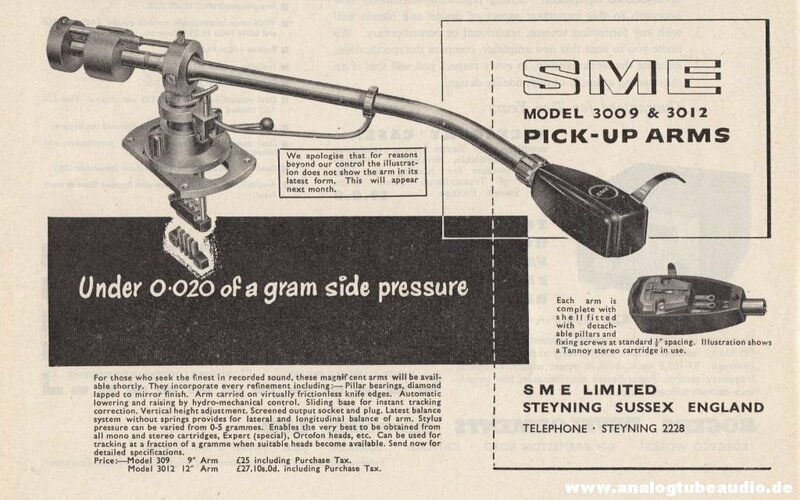 This is a small sensation, this advertisement was published by SME in 1958 or 1959. Nothing really special, but when you look at the construction of this SME tonearm, is based on the construction principle of the early Ortofon tonearms. The vertical bearing is identical to Ortofon’s early bearing designs, and the tracking force setting is very similar to Ortofon’s design. Probably, the construction of the horizontal bearings was also adopted in large parts. This tonearm was probably only built in handful exemplars. However, the text description matches with the existing SME 3009 Series 1. In an addition it´s noted, that the illustrated tonearm is not shown in the current form.